The long tradition of excellent calender technology for the textile industry is now continued with the teXcal Raconip TT calender. The teXcal Raconip TT mainly targets customers experienced in the manufacture of technical textiles with highest quality standards, for example, sports and work wear, sailcloth, parachute fabrics, or packaging materials. The teXcal Raconip TT offers the operator a number of features that are useful during operation. For example, user-friendly access to all relevant areas of the calender, excellent data management for the calender process and product quality in real time, and extended maintenance intervals. 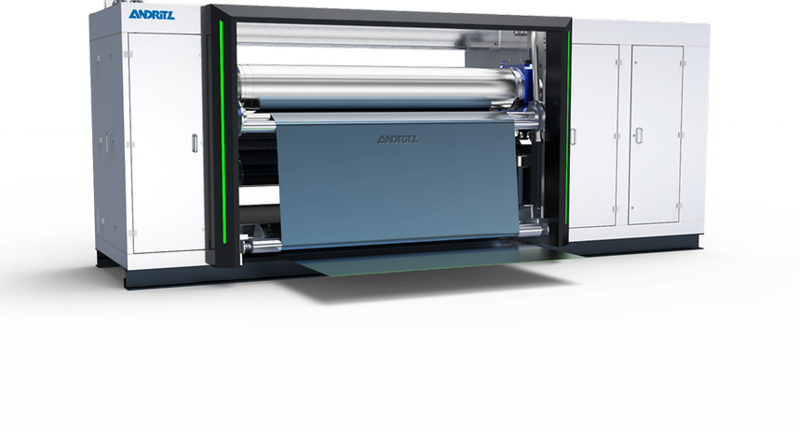 Overall, ANDRITZ has focused on versatility and flexibility in development of the new textile calender – properties that should make this equipment more competitive. In addition, the calender contains an innovative, deflection-controlled roll, the Raconip TT. It offers highest flexibility by providing unrestricted profiling over the entire fabric width by means of hydrostatic pistons. This ensures top quality, such as absolute flatness and spot-on air permeability. The new calender has been developed in cooperation with Rolf Ramisch, a well-known specialist in textile calender technology. ANDRITZ will introduce visitors to the processing of glass fibers with wetlaid technology. Nonwoven end products based on glass fibers can be found almost everywhere: in ceiling tiles, cushion vinyl flooring, insulation, wallpaper and surfaces, geotextiles, batteries, roofing materials, as well as other applications. Glass fiber as a basic component is an excellent composite material and offers numerous advantages that lend the resulting products unique properties. And because of its wide range of applications, products made of glass fiber material have a strong, growing market. The manufacture of products based on glass fibers requires particularly gentle treatment in the stock preparation and laying processes. ANDRITZ meets these requirements perfectly. At Techtextil, ANDRITZ Wetlaid experts will present details of this new configuration to interested visitors for the first time. Another focus of ANDRITZ at Techtextil 2019 is its needlepunch technology, which the company has been supplying successfully for many years to a variety of industries such as geotextiles, roofing materials, filtration, technical felts, carpeting, and many more. One of ANDRITZ’s main areas of needlepunch excellence is the needlelooming process, which gives the material the decisive properties for consistently high quality. ANDRITZ needlelooms include pre-needling units as well as standard needlelooms and, above all, specialized needlelooms that can be fully adapted to the customers’ needs. Due to the versatile specifications and processing quality of its needleloom systems combined with robustness for a sustainable product life cycle, ANDRITZ presents its solutions for further innovative end uses wherever this form of mechanical bonding is required. With a 3D-print model of the SDV needleloom at the booth in conjunction with Augmented Reality, the visitor can gain a unique insight into the ANDRITZ smart service solutions marketed under the Metris technology brand name. This includes the new Metris spare part catalog as well as digitally based technical documentation. The ANDRITZ team is looking forward to meeting you at Techtextil 2019 and will be pleased to advise you on how to make your production even more flexible, productive and efficient.